This isn’t a real post because it won’t contain any of the work related stuff or the stuff about being home that I’ve intended to write about but that’s okay. You want to know why? Because I make the rules, that’s why. Today, I put up a Christmas tree. It’s really the only Christmas tree I need in my life now, too. The way I look at it, and I was explaining this to my parents, I don’t need a huge tree or a thousand lights because I’m not where I plan on ending up in life. If I’m going to be moving around, I don’t want to have to take these things with me or have to get rid of them. 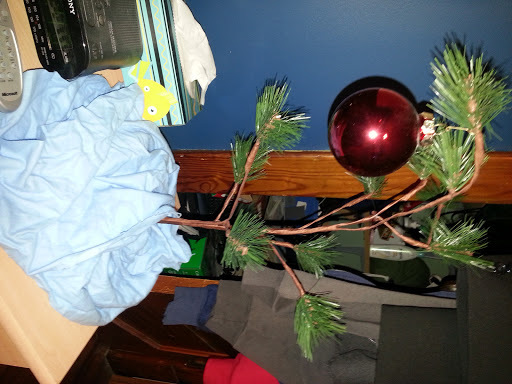 So, for now, I’m happy with my Charlie Brown Christmas tree. That, and I think it is a good reminder about what the holiday is actually about. It takes the edge off all the shopping we end up doing. Also, I got my first Christmas card the other day and I’m starting to feel old. Friends of mine are at the responsible stage of their life where they’re sending me cards. Weird.